This is my latest work. It is fabric "inches" mounted on stretched canvas (5" x 5") that I painted and stenciled. The theme for the Take It Further Challenge is "little details" so I thought a way to use my inchies would be great. I had made the "inchies" while I was visiting my daughter in California last year. They were for an "inchies" swap (1" x 1"). Not all the people who were in it completed their inchies, so I had this many left. 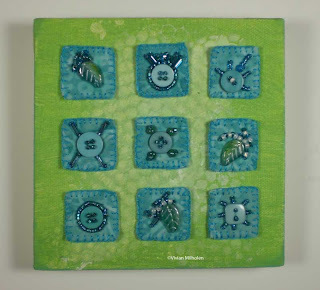 They are fabric bases sandwiched with batting between the layers and beaded centers. The edges are buttonhole stitched. I finally found a way to display them and it creates a nice memory of my visit to California! It is always nice to have mother/daughter time. Sometimes it's the little things that count. I love the look of using the stretched canvas because it gives the piece a 3-D look. Wow! 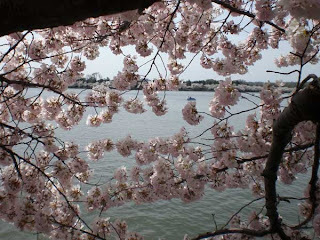 I had seen pictures on TV, but the actual sight of the Cherry Blossom Festival was awesome! The trees were spectacular! The blossoms were so thick, the branches hung down. We took the metro (crowded was the word!) to downtown DC and got off at the Smithsonian. Over a million people also went that day. I have never seen so many cameras, ever. 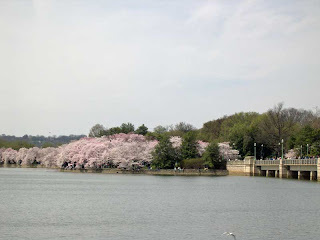 We charged right into the crowd and when we got to the tidal basin, the trees were so beautiful that there seemed to be a reverent hush over the crowd. The trees were given to us in 1912 by the Japanese. There are over 3,750 of them (different varieties). I will add a few pictures of the trees, but I could not capture the magnificence of their beauty. If you ever get a chance to go, don't miss it. This was our first time to see it, maybe this year was just a great year for the blossoms, but we loved it. We walked around the entire tidal basin which includes the Jefferson Memorial and the FDR Memorial. Awesome sight to see! After we saw the trees, we hiked over to Pennsylvania Avenue and had lunch. Well, our lunch was at Potbelly (one of my favorite places to eat) next to the Renwick. We went to the Renwick Gallery to see the new exhibit which was "Ornament as Art", a metal jewelry exhibit. After that, we walked across the street to the White House and took some pictures. There was a pick-up truck parked in the driveway which we decided might belong to the President. We couldn't tell if it had Texas plates or not, but it did look funny to see a pickup truck parked out front. As we got there, a group of people were exiting the visitors' gate. We found out later on the evening news that Laura Bush had held a High School reunion there for her Midland, Texas classmates. There was also a war protest going on right out front. The protesters are always interesting to see with all their signs and such. I just love all the interesting things we get to see in DC. There are so many more places and events to explore. It was a fun day! I have been having so much fun with my new camera, that I haven't taken the time to blog about it, yet. Matt surprised me with this Casio Ex-Z77 for my birthday present. Wow! Was I ever surprised! Don't you just love the color? It's a periwinkle blue, which is a purple/blue color. It takes photos in a snap. I have taken lots and lots of pictures of Emma as you see below. This camera has a Best Shot setting that gives you tons of options for taking good pictures. 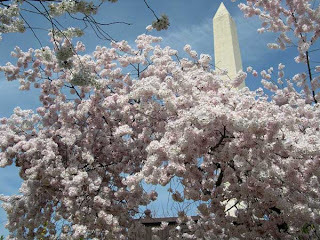 We took it to the Cherry Blossom festival this weekend in DC. 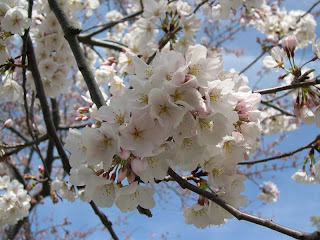 It took great pictures of the beautiful trees with the blossoms. I will blog about that in a separate post. It takes movies with sound and has a special You Tube video setting (Haven't tried that, yet.) 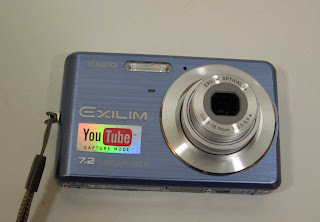 Anyway, I love this little, compact (fits oh so nice in my purse) camera. I can quickly take snapshots of Emma before she moves and makes the picture blurry. I'll be adding more pics of Emma later. 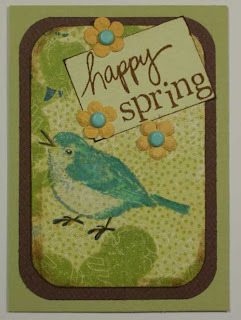 I forgot to say it on the first day of spring, so, "Happy Spring!" I just finished this little bird ATC. This is my first time to use gamsol and colored pencils. In case you don't know, gamsol is odorless mineral spirits. It blends the colored pencils so you can achieve shading. Fun! 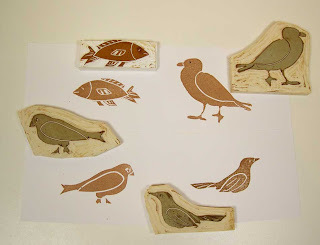 Here I am joyfully carving stamps and I find Michelle Ward's Art Crusade # 18 which is carving your own stamps! I love carving my own stamps! I am addicted to it! I can't wait till next month...stencils! I'm so happy she has this crusade I can join! There are others out there like me! Here is how I transfer my designs: I draw or trace the design onto the back of a Post-it-Note with a 0.7mm #2 mechanical pencil. Then, I flip it over, sticky side down onto the rubber. Use a bone folder, edge of a ruler or whatever to rub the image (carefully) onto the rubber. Presto, your image is transferred. I use the pink and white carving material that comes in blocks. I also use the poly white erasers. Another hint, sometimes the material has a lot of loose, carved tiny bits that keep getting on your ink pad. I use cellophane tape to remove it. Just press it onto the newly carved stamp and it removes all those tiny bits. 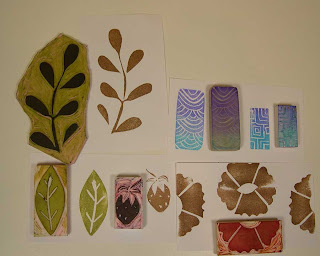 Remember, I carved stamps and posted the fabric in this post? Fun! St. Patty's Day is here...when I woke up, I actually forgot it was my birthday...but maybe it was because we celebrated my birthday on Saturday at Tyson's mall. My husband and daughter cooked up a nice surprise for me at the Coach store. They schemed together to have a new purse waiting for me to pick up. 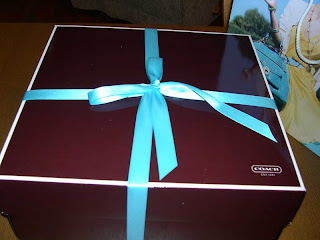 Here is the pretty box below with aqua satin ribbon (quilt fodder, of course). Then, the purse inside...it even comes with a drawstring satiny bag for storage. Cool! 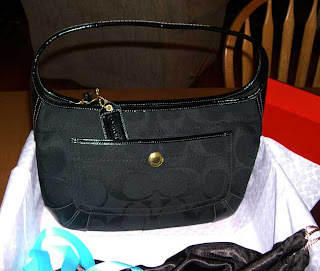 Anyway, it's my first Coach bag. I think this would make a nice tradition every year. (hint...for hubby reading this). I also had a huge slice of my favorite double chocolate cake at Gordon Biersch. Oh, and we had pizza and salad, too. But the cake is the yummiest! 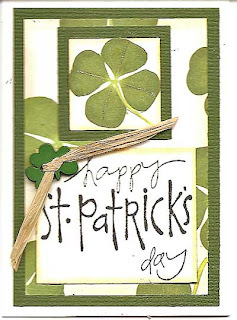 I received a really cute card from my friend, Susan...it has a Boston on it! Also a cute card from my daughter and a cute froggy fabric ATC from my cyber friend, Diane. It's a nice day. I am going to do a bit of shopping today for fabric. I am so into crocheting while I watch movies on TV, now. I just figured out a cool hexagon pattern and I'm making a new afghan using pottery barn colors. Emma asleep under the sleep inducing afghan. It's almost instant sleep for her when the afghan touches her. 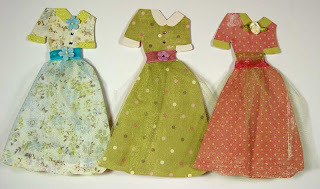 These are Vintage Fashion ATCs I made for a swap. 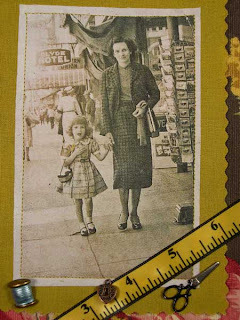 I had some scrapbook paper with these tiny vintage ladies on it, so I enlarged them and used them on an ATC. 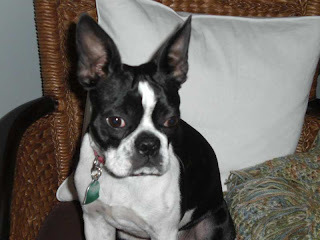 Emma (our Boston Terrier) and I were lazy today. We laid on the sofa and watched chick flicks. We were wrapped in the sleep inducing new afghan that I crocheted. I haven't crocheted an afghan in many years. I forgot how warm and cozy they are when the weather is cold outside. 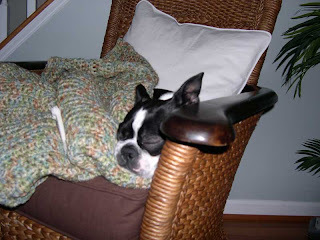 Above is a picture of Emma asleep in the chair with the afghan. Of course she has her little chew bone nearby just in case she needs it. Emma will be 9 months old next week! We will both have a birthday celebration! This is a journal quilt I made using the theme of "What are you old enough to remember?" from the Take It Further Challenge. I found this challenge hard to start as it brings back too many memories. 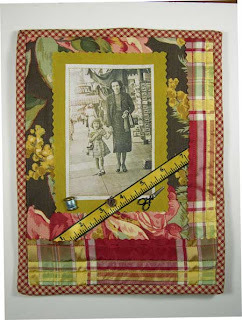 This quilt is a picture of my mom and I shopping. I remember we would always dress up for the trip to town. My mom sewed most of my clothes, thus the sewing notions attached to the quilt. I remember the sound of the taffeta full skirts swishing as I walked. The plaid fabric on the side and bottom are taffeta. I remember the photographer who would snap our picture on the sidewalk...this is one of those pictures. I'm so glad my mom bought this one! 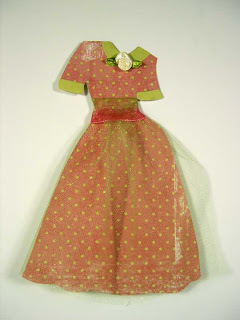 I remember her black and silver scissors which she used to cut fabric and paper dolls for me from a newspaper! I remember how much I wanted to sew and iron just like her. I did sneak to the ironing board one day to iron my doll clothes...I still have the scar where I sat the heavy iron down on my hand. It burned all night and she kept a bowl of ice water beside my bed to soothe it. I remember the large flower prints on our drapes which is similar to the background fabric in the quilt. OK, I could go on and on with remembrances but I must stop because I have to iron...ugh...I hate ironing! But I love sewing and cutting paper with my scissors! Here they are! Party dresses! 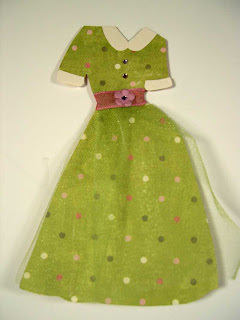 These are made from sturdy cardstock using a vintage dress pattern. I traced the dress pattern and enlarge to the desired size (4"x6"). I then traced the pattern to clear template plastic so I can make more later. 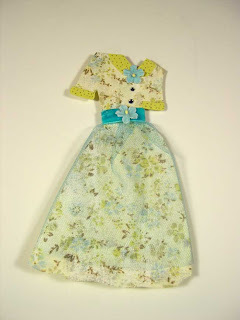 What fun it was to embellish the dresses! I guess I was imagining that three sisters were going to a Spring tea party. (It's a Southern thing) So, I had to use flowers, velvet ribbons and of course, a tulle overlay. The cardstock is Wild Asparagus. I like to use this brand because it is so sturdy. I just have to make more of these! And if I can just find the pattern for my wedding gown (35 yo), I think it would be fun to make. I really wish I had saved my old patterns. These three are going for a swap. I just have to make more.